ISLAMABAD, Oct 26 (APP): Asian Development Bank (ADB), Wednesday said the economy of Pakistan has made encouraging progress during the past three years and continuation of reforms programme would make the country an appropriate destination for investments in future. 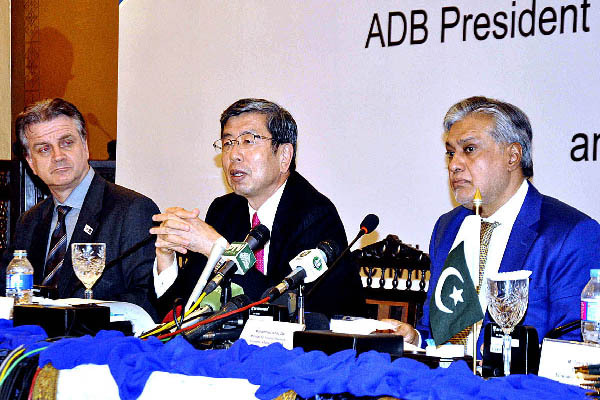 “This is my second visit to Pakistan and follow up of 2014 visit to the country and I am encouraged by the progress made by this country,” President ADB, Takehiko Nakao said while addressing a joint press conference with Finance Minister Senator Muhammad Ishaq Dar here after signing $250 million Border Service Management Project agreement. The ADB President said that many economic indicators have shown progress, enumerating that the growth rate has climbed up while inflation reduced, with fiscal deficit coming down and foreign exchange reserves built up. He said that there were many encouraging signs supported by the structural reforms, adding the government has focused on reforms agenda to make the country friendly for investment. He expressed the hope that the reforms would win a better place for Pakistan. place for investments,” he remarked Takehiko Nakao said ADB would continue its cooperation and support the country in development of infrastructure and social sector. He said that trade financing was one of the focuses of the bank and it has been supporting Public Private Partnerships through its office here. He said that during his visit to Pakistan he had discussions with the government functionaries of host of issues and initiatives. Speaking on the occasion, Senator Muhammad Dar termed the Central Asian Regional Economic Cooperation (CAREC) conference a highly successful and productive. He said in addition to other issues, the member countries also thoroughly discussed the theme topic “Beyond CAREC 2020” to take this cooperation to further productive results. He said Georgia became the 11th member of the CAREC and it has formally been adopted in the forum. Dar said agreement to establishment of CAREC Institute for capacity building was also signed between Pakistan, China Uzbekistan and Kyrgyzstan for promotion of transport infrastructure, trade and trade policy. It is pertinent to mention here that ADB and Pakistan signed border management service project for the creation of Landport Authority with the total cost of $301 million out of which ADB would be providing $250 million. President ADB, Takehiko Nakao said that Pakistan successfully completed the three years International Monetary Fund (IMF)’s Extended Fund Facility which was indicative of the fact that how the government was committed to continue its reforms agenda. Dam, the ADB President said the Bank had not yet decided for financing of this mega project because it was a huge project which required very hefty amount. He said this project could be financed through funding by a combination of development partners including World Bank and IMF. producing a big amount of energy but also would provide huge water reservoir for irrigation purposes. Corridor (CPEC), Mr Nakao said the ADB was already supporting to promote regional connectivity and it would also support CPEC as it had the potential to promote regional integration. for any country was very important as it provided the basis for growth. “Pakistan needs sound policies for sustainable macro economic stability”, he added. sad incident that took place in Quetta last night. He said that he was greatly grieved to hear the news of the incident. He also said that such incidents are shocking but the world acknowledges the remarkable resilience shown by the government and people of Pakistan for eliminating terrorism.